As an invaluable tool, they must be operated properly and always with safety in mind. However, that’s not always the case. OSHA statistics reveal there are more than 30,000 serious injuries involving forklifts (and similarly powered vehicles) in the U.S. each year. Approximately 20 percent of those accidents occur when a forklift strikes a pedestrian. This can make the forklift the most dangerous equipment in your facility. With proper training and safety measures in place, the majority of accidents can be avoided. Supervisors must consider two key groups when discussing forklift safety: drivers and pedestrians. Implementing a forklift warning light system is an excellent and economical option to help warn pedestrians of nearby forklifts and add an additional layer of safety. 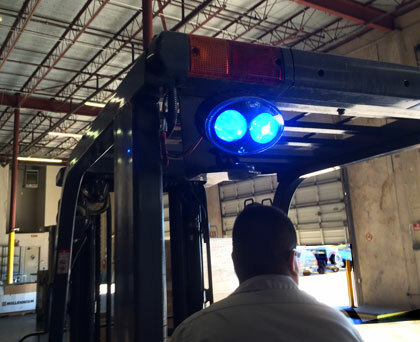 A forklift warning system is placed on the front or rear of a forklift (or both) projecting a bright circle of (typically blue) light onto the floor about 15 feet in front of (and/or) behind the vehicle. In a noisy, busy warehouse, it’s a visible indicator of an approaching vehicle. Let’s look at the specifics of where, how, and why it can help. The moving light of the forklift warning system catches the attention of either pedestrians and other forklift drivers (or drivers of other vehicles in the space). It’s a clear indication of whether a forklift is moving (forward or backward) or stationary. In warehouses with blind intersections or rack aisles, and/or where there is ambient noise, it’s an excellent additional safety measure. A forklift warning system is mounted – either by bolts or magnets – to the front, back, or both ends of a vehicle and wired to vehicle power. It can attached to forklifts, walkies, loaders, Cushmans, AGVs, and other industrial vehicles. These lights are particularly well suited to dock areas. When a forklift enters a trailer, its light precedes it as it backs out, helping to warn people working in the area. Two bright LED lights (blue lights are the most common) increase the visibility of approaching vehicles. As a forklift or other vehicle moves, the bright light glides across the floor about 15 feet ahead or behind it, alerting workers in the area of the approaching vehicle. 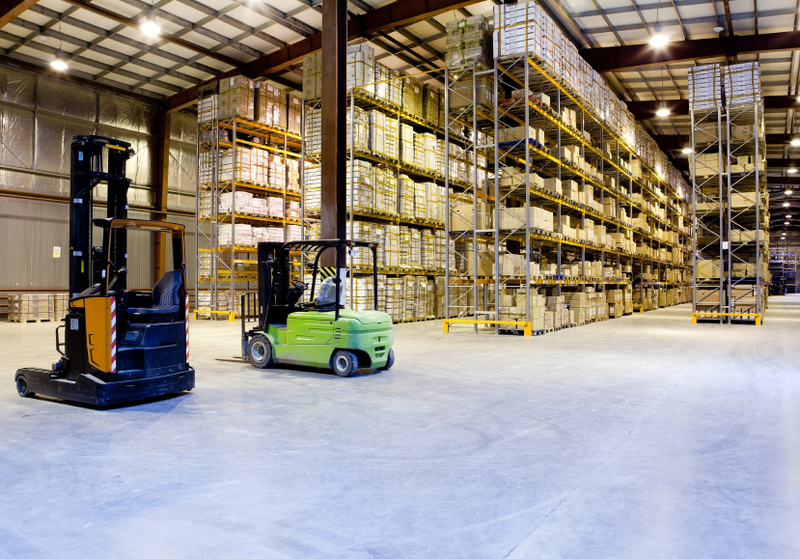 In a loud warehouse, the moving light catches the eye and is likely more effective than an auditory alert (beeping, etc.) or stationary lights (which are always on and lack the movement aspect of a forklift light). Since the light moves with the vehicles, it also serves as an indication of whether the vehicle is stationary, approaching, or retreating. Forklift warning systems are a simple and affordable way to improve safety for people who share space with forklifts and other powered industrial trucks. The statistics illustrate workers on foot are endangered if they share space with these vehicles and additional safety measures only work to enhance the overall health of a workspace. Forklifts are big, heavy machines that do yeoman’s work in the warehouse environment. It’s essential that drivers are trained to operate these machines safely for their own sake and for the sake of those around them. Adding safety enhancements, like a forklift warning system, show a company’s commitment to a safe environment. Manage traffic: design, implement, and enforce a traffic management plan that restricts workers on foot to areas where forklifts don’t operate. A good traffic management plan will clearly lay out where and when forklifts can operate, and where pedestrians should enter rows or aisles that are also used by forklifts. “Hard guard” critical areas: For critical areas that can be guarded, use bollards, guard railing, and other means to deflect impacts if they do happen. This is frequently done near in-plant offices, work cells, warehouse entry/exits, and other places where people are usually present or expensive equipment needs to be protected. 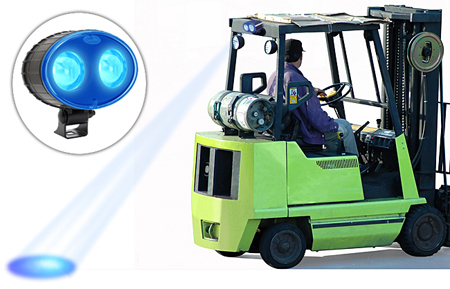 Automate and warn: Forklift blue spot lights are an excellent start. For some areas, you may want to deploy proximity detection systems, motion sensors, intelligent gates, and other methods to help warn and help manage traffic.